Please see the image and information at the bottom of this page for more instructions. Once you click one of the buttons below, you will be directed to a PayPal shopping cart where you will be able to select the number of people you wish to pay for. 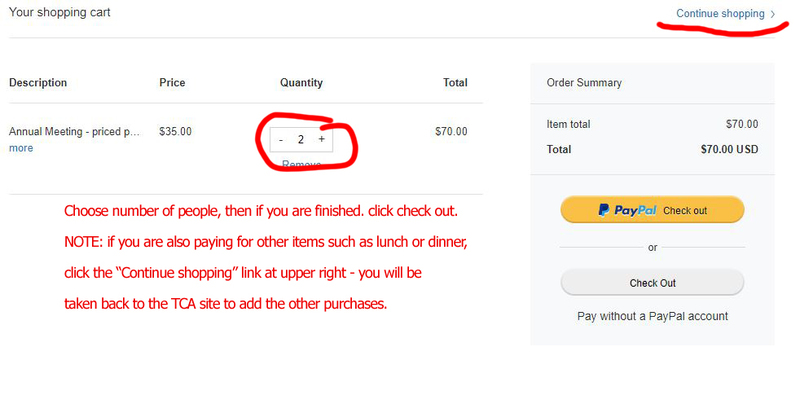 If you also want to purchase additional activities such as the lunch and/or supper, just click the “Continue Shopping” link at PayPal and you will be redirected back here for more purchases – they will all be added to your shopping cart. When finished, click one of the checkout buttons. You can either use a PayPal account, or your credit card for final payment. All transactions on the PayPal site are secure.